Serious Materials announced the commercial launch of its glazing retrofit system that was used to update the windows of the Empire State Building for energy efficiency. iWindow is a retrofit glass system that doesn't replace the existing glass or alter the exterior appearance of the building. Serioius Materials says the iWindow panel can be installed on the inside of the existing glass in as little as 20 minutes. At approximately $20 per square foot total installed cost, iWindow is 50% to 75% less costly to install compared to a typical aluminum replacement system which can dramatically impact the viability of such retrofit scenarios. Energy efficiency improvements can also return higher rents, secure greater occupancy, and generate higher resale value. 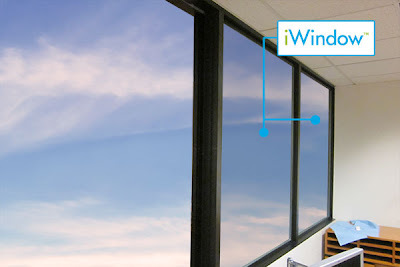 Each iWindow incorporates the SeriousGlass system. SeriousGlass units include spectrally-selective suspended film systems that create multiple air chambers, accomplishing high thermal performance of triple pane glass without the additional weight and structural concerns. Beyond super-insulating performance, SeriousGlass enables high light transmission, 99.5+% UV blockage, and reduced fading and damage to interior furnishings. iWindow is designed for any curtain wall or window wall commercial retrofit application and is ideally suited for historic and landmark projects as it allows preservation of the existing façade. “With iWindow, we have addressed the fundamental challenges preventing more widespread implementation of energy efficiency retrofits in commercial buildings,” said Ian Sullivan, GM and VP of Serious Materials’ Windows division. “iWindow was an innovation that in part evolved out of our work at the Empire State Building. Now, iWindow provides access to the broad market for our high-performance SeriousGlass in a simple package that can be quickly and cost-effectively deployed to solve both energy efficiency goals and occupant comfort considerations”. Serious Materials upgraded the 6,514 dual pane windows in the Empire State Building with SeriousGlass to create super-insulating units that increased the thermal performance of the windows by up to four times. By 2015, more than 75% of commercial retrofits will incorporate energy efficiency measures, largely due to higher energy performance standards and programs such as the Better Buildings Initiative, which aims to make commercial buildings in the United States 20% more energy efficient. According to the U.S. Department of Energy, 25% to 35% of energy wasted in buildings today is due to inefficient windows, adding up to 10% of total carbon emissions in the U.S. annually.